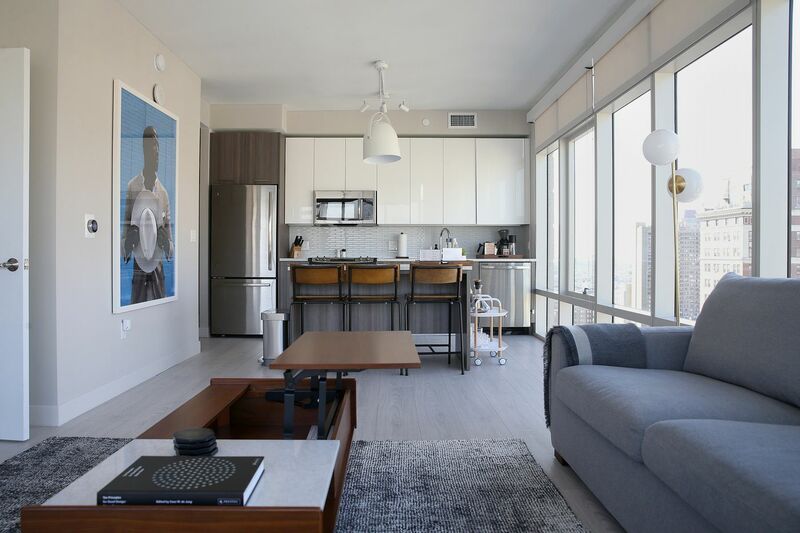 The living room and kitchen in a two-bedroom suite, offered as a short-term rental by Lyric, are pictured in the 1213 Walnut apartment building in Center City. If you’re an apartment dweller in Philadelphia, you might want to hurry and meet your new neighbors. They may not be around for long. Huge numbers of apartments throughout the city center are being converted into ersatz hotel rooms by a new breed of well-funded operators such as Sonder Corp. and Lyric Hospitality Inc., which are targeting guests seeking homier overnight stays. More than 1,300 units in existing apartment buildings and those under construction are either bookable for hotel-length stays now or have been set aside for that purpose down the road, according to an Inquirer tally based on zoning notices, booking websites, and interviews with landlords and operators. For perspective, that’s about as many guest rooms as there are in the state’s biggest hotel, the Philadelphia Marriott Downtown near the Pennsylvania Convention Center. Most of this activity has occurred over just the last year, and the tally doesn’t include units in buildings whose owners have indicated they will include short-term stays but have not said how many, such as Southern Land Co.'s Laurel tower beside Rittenhouse Square, which will be Philadelphia’s tallest residential building when completed. The apartment-hotel operators’ basic pitch to travelers is that their units offer more space and homestyle comforts — often in less touristy neighborhoods — than a typical hotel, usually at a lower price, though they often require minimum stays of more than just one night. For the weekend of June 10, for example, a studio apartment with a washer, dryer, and full kitchen can be booked from San Francisco-based Lyric at the newly built 1213 Walnut St. apartment tower for $164 a night, $2 cheaper than the Rodeway Inn budget hotel across the street, according to the two brands’ websites. As an extra enticement, Lyric also outfits its kitchens with pour-over coffee setups featuring beans from local roasters (ReAnimator in Philadelphia) and supplies guests with turntable-equipped sound systems to play vinyl recordings of artists with local roots (Son Little, Dr. Dog, Santigold). More than 1,300 apartment units in buildings in or near Center City Philadelphia are bookable for hotel-length stays, or have been set aside for that purpose in the future. Apartment-hotel operators say their units offer more space and amenities than typical hotel rooms, often at a lower price. Part of what’s fueling the growth in the short-term stay-business — in Philadelphia and other cities — is a potential surplus of apartments after aggressive construction during the nearly decade-long economic expansion, said Stuart Levy, a management and tourism studies professor at George Washington University in Washington. At the same time, travelers are increasingly open to nontraditional hospitality options, as online access to information on tourism sights and amenities such as restaurants makes them less dependent on concierge staffs, room service and on-site eateries, Levy said. “It’s become easier than ever to really have a kind of ‘D.I.Y.’ travel experience,” he said. In Philadelphia, apartments available for short-term stays range from the single unit that the locally based Birdnest Group has under lease at the Berger Building, a former roofers’ supply factory in Old City, to the 268 hotel-apartments managed by the AKA division of Philadelphia-based Korman Communities Inc. in the soaring FMC Tower by the Schuylkill in University City. Other examples include the 22 units that Spokane Valley, Wash.-based Stay Alfred Inc. offers at the Granary apartment building at 19th and Callowhill Streets and the 17 apartments available from a Philadelphia company calling itself Ur Home in Philly at the Luna on Pine at 400 S. 40th St. in University City. Still to come are as many as 25 units that Kasa Living Inc. of San Francisco plans at the Goldtex Apartments on 12th Street north of Vine Street and all 186 apartments that are planned at the historic Witherspoon Building office tower at 1319 Walnut St. after its conversion into dwellings that Sonder, also based in San Francisco, has a deal to manage. In some of the nation’s biggest tourism magnets, the growth of this hospitality niche has prompted a backlash amid concerns that the practice is driving up housing costs by monopolizing supply. Cities across the country are grappling with the growth of apartment-hotel conversions and other non-traditional hospitality offerings, such as Airbnb bookings. Lawmakers in New Orleans have responded with proposals to limit how much of an apartment building can be offered for short-term stays and to require projects with such units to also include dwellings that are affordable to low-income residents. In Boston, meanwhile, city leaders have passed rules that prohibit non-owner-occupants from leasing out dwellings to short-term visitors, while officials in Washington, D.C., passed a law that stops non-owner-occupied properties from being rented to short-term guests more than 90 days a year. Lauren Cox, a spokeswoman for Philadelphia’s Commerce Department, said officials here have been monitoring the growth of short-term apartments but don’t currently see them as harming the city’s housing market or hospitality industry. The short-term stays may actually be helping sustain that strength by sopping up excess inventory during what’s been a strong uptick in new apartment construction, said Kevin Gillen, a senior research fellow specializing in housing markets at Drexel University’s Lindy Institute for Urban Innovation. Landlords like the arrangement because the apartment-hotel operators often lease large blocks of units for years at a time, so they don’t need to worry about finding occupants themselves. Pete Soens, a partner at the Witherspoon Building’s owner, SSH Real Estate, said his group’s deal with Sonder means the entire property will be generating revenue from the time it opens, while still allowing for the units to eventually be offered under conventional leases after its agreement with the operator lapses. “There’s no downtime,” he said. “We’re 100 percent leased." Notably absent from the tally of available short-term apartments are units in buildings owned by Center City’s biggest landlords, locally based PMC Property Group and Apartment Investment & Management Co., or Aimco, of Denver. Aimco spokesperson Jamie Alvarez said her company prohibits such uses. “We have had an overwhelming response from our residents with complaints about short-term rentals turning our properties into a hotel-like atmosphere," she said. Operators say they strive to bunch their units together within buildings, preferably on designated floors, to avoid interfering with full-time residents. In Philadelphia, the apartment-hotel-hybrid format was pioneered as a large-scale operation by Korman, which opened its first property in the city, the AKA Rittenhouse Square, at 19th and Walnut Streets in 2007. AKA was followed by Method Co.'s Roost Apartment Hotel brand, founded by a former Korman executive, which now controls 60 units over five floors at a new apartment building that’s part of the growing East Market development on Market Street between 11th and 12th Streets, among other properties. Smaller locally based operators include Birdnest, which leases out three units at the Divine Lorraine apartments on North Broad Street. But most of the recent activity in the sector involves out-of-town start-ups that have attracted generous sums of venture capital to fuel their growth and which are arriving in Philadelphia after expanding aggressively in other cities. Sonder, which has raised $135 million from investors, has said it has 500 units in planned and existing buildings under lease, including those at the Witherspoon. Stay Alfred, with $62 million in funding, operates 96 units across the city, with its biggest presences in the Granary and the Point at 1601 Sansom St. Lyric, which has attracted $15.5 million and is said to be potentially in line for $75 million more from an Airbnb Inc.-led group, controls 86 units in the city, mostly in 1213 Walnut St. and the newly opened Hamilton apartments at 15th and Hamilton Streets.